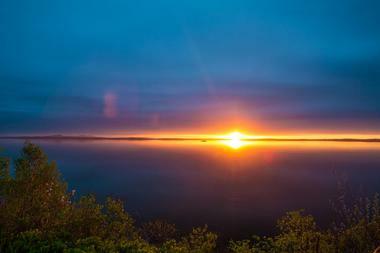 Bar Harbor is a beautiful town located on Maine's Mount Desert Island next to Acadia National Park. 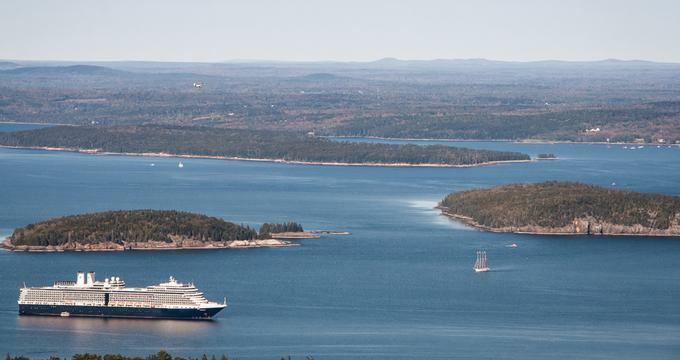 Bar Harbor is one of the favorite tourist destinations on the East Coast, offering historic charm, a beautiful coastline and a range of activities. 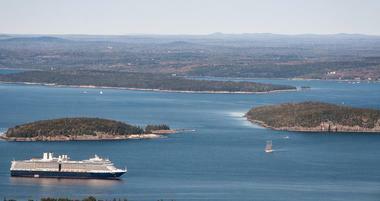 Here are the best things to do in Bar Harbor, ME. The largest island off the coast of Maine, Mount Desert Island’s spectacular natural beauty attracts millions of tourist every year. The island was originally settled by Abenaki Indians some 5000-10,000 years ago, and the French discovered it by accident in 1604. In mid-19th century painters of the famous Hudson River School started a regular pilgrimage to the island attracted by its rugged beauty and it is their art that made the island known to the world. The rich and famous started building magnificent mansions all over the island, started clearing roads and trails and creating spectacular gardens. 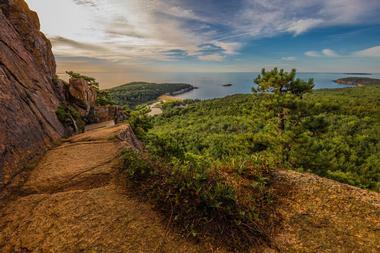 Acadia National Park, which today protects most of the island, was established in 1919 in order to curb rapid development and cutting of island trees for lumber. Fishing, shipbuilding, and tourism were the island industry then as they are today. While the quaint historic town of Bar Harbor and three other small cities provide more sophisticated entertainment with galleries, museums, theater, excellent restaurants, and shopping, most visitors come to enjoy shady trails of Acadia National Park, whale watching or fishing trips. A beautiful way to start your visit to Bar Harbor is to wake up early in the morning and take a slow stroll along the Shore Path. Established in 1880, this lovely coastal trail starts next to Agamond Park at the Town’s Ells Pier and is one of the best things to do in Bar Harbor, Maine. After passing the historic Bar Harbor Inn, the path wraps around a point and then continues south along the eastern shore of the island. You will pass on the way several magnificent palaces known as cottages. The view over the water will enchant you with the play of colors and shadows that inspired so many artists through centuries. Over the water, you will also see a number of small islands – the Porcupine Island, Egg Rock, and many others. Sit on one of many benches, breath the clean salty air, and do not be surprised if you spot some of the celebrities that make Bar Harbor their summer home. 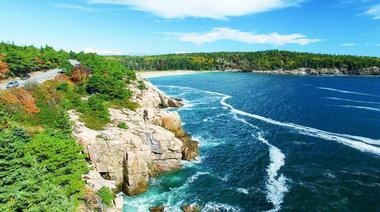 Mount Desert Island and Acadia National Park are best explored on foot. 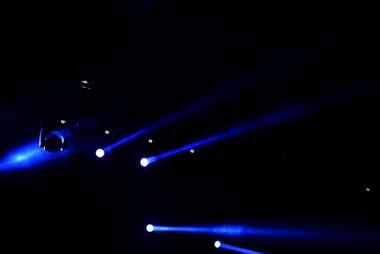 That is the only way you will really experience this magnificent world of sounds and sights. If you take the Free Island Explorer Shuttle Bus, you will arrive at the Sand Beach, the beginning of the Ocean Trail. Stroll along the meandering path by the rough, rocky coast, until you arrive at the Thunder Hole. If the tide and the waves are right, you will hear the sound much like thunder. Pay attention to the heady smell of wild roses from the many bushes that grow in the area. Keep going until you arrive at Otter Cliff, 110 feet high rugged cliff that turns golden with the rising sun and is a photographers’ dream. If you decide to walk back the same way, the entire loop is only about four miles. 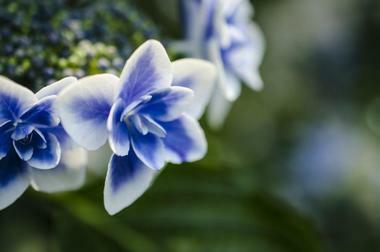 There are also many small side paths that will take you closer to the shore. Watch for the rogue waves. 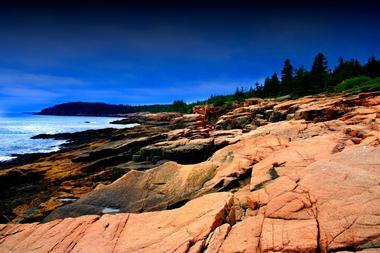 Acadia National Park is a spectacular national treasure on the rugged coast of Maine. Situated on Mount Desert Island, the park is part of a 47,000-acre Atlantic coast recreation area that features rocky beaches, pristine woodlands, and glacier-capped granite peaks. The park is home to breathtaking natural landscapes that teem with a diverse variety of fauna and flora, as well as the Cadillac Mountain - the tallest mountain on the U.S. Atlantic coast. Frenchman Bay in Maine is located between Mount Desert Island, the southern coast of Maine, and the western shoreline of Schoodic Peninsula. Many small islands are scattered throughout the bay including Bar Island, Sheep Porcupine, Bald Porcupine, and Long Porcupine Islands. 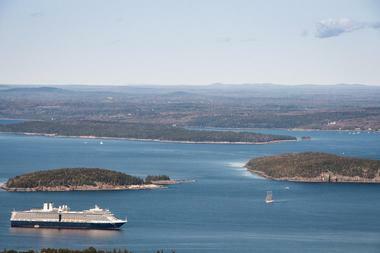 Bar Harbor is the largest town on the coast of Frenchman Bay. Bar Island becomes a natural land bridge to the Mount Desert Island during low tide. If you have a chance to climb the Cadillac Mountain on Mount Desert Island, the entire Frenchman Bay will spread ahead of you like a magnificent painting. 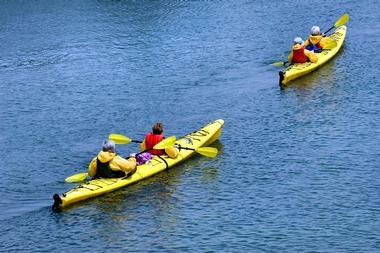 Paddling your own kayak is another fun to explore all the islands in the bay. After the old Grand Central Hotel was torn down in 1899, the town of Bar Harbor decided to turn this 1.5-acre site in the center of town into a public open space. The first structure built in 1899 was a bandstand. A stone wall and a bench were added in 1904 in memory of local army veterans. In 1905, the town moved its cast iron clock to the green, where it still stands, and is one of the town’s best-known landmarks. In 1909, John Callendar Livingston donated the antique Italian fountain to the town in memory of his late wife, Julia. Many pathways cross the park, leading to the fountain, and its cobblestone surrounds, circled with colorful flowerbeds. A granite seat wall is one of the latest additions. The College of the Atlantic Gardens consist of several historic gardens, community gathering and recreation areas, an arboretum and walking pathways for the community to enjoy. The seaside campus of the college aims to inspire and educate the public about horticulture through the beauty of landscaped gardens. Signature gardens include The Turrets Sea Side Garden, which features a blue-grey color scheme; The Sunken Garden, which was created for the original owners of the Turrets, John and Lela Emory; and The Straus Gardens in the ‘Kathryn W. Davis Student Village’. Designed by landscape architect Sam Coplon, these gardens feature different courtyards that represent regions around the world along the 45th parallel. A contemporary Northern European garden boasts beautiful maple trees and Japanese stewartia in winter and kousa dogwood blossoms in the spring, while a Maine cottage-style garden features native species such as Cunningham’s white rhododendron, mountain laurel, and a Japanese-inspired garden. 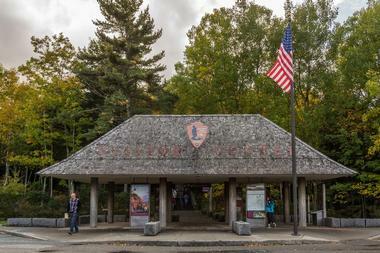 Make most of your visit to the Acadia National Park by exploring The Hulls Cove Visitor Center first, your source of all information you will need. Have a look at the huge three-dimensional relief of the park to get the idea of its size and distances between main attractions. Talk to the park rangers about things you should know, things you should do, and things you should not do. Pick up some free brochures, trail maps and other useful documentation. Take 15 minutes to watch an interesting audiovisual presentation that covers most important park features. Check the schedules of guided hikes, walks, boat cruises, kids’ activities, and other programs. Have a look around the Visitors’ Center, there are many high-quality exhibits, including those on animals that live in the park. Walking is great, but sometimes you just cannot see and do everything you want on foot. 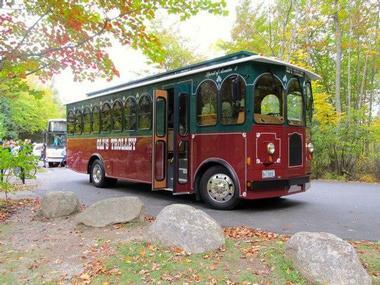 Oli’s Trolley tours are the next best way of exploring Bar Harbor, Acadia National Park, or the Cadillac Mountain. Charming old-fashioned trolleys go slowly along the coast, through the forests and quaint city streets, while a knowledgeable guide tells the stories of the area glorious past, quirky characters, most important landmarks, and most expensive mansions. 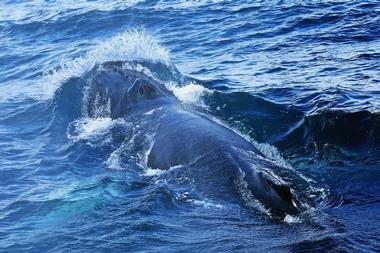 Bar Harbor Whale Watch Company offers a variety of tours in and around Bay Harbor, ranging from whale watching and sunset tours to cultural, nature and sightseeing tours. Whale-watching tours take visitors into the heart of the whale’s habitat to see humpback, finback, and Minke whales, as well as porpoises, seals, dolphins, offshore birds, and North Atlantic Puffins. Enjoy breath-taking views over Frenchman’s Bay on the Sunset Tour, while the Lighthouse and National Park Tour explores the Somes Sound and Great Duck Island with their beautiful old lighthouse. 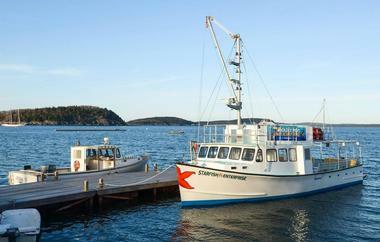 Join the crew of the Miss Samantha, Maine’s largest lobster passenger boat for a fun-filled and informative lobster fishing and seal watching tour, where you can watch experienced fisherman haul in their catch. Bar Harbor Whale Watch Company tours depart daily from the town pier in downtown Bar Harbor throughout the summer season. Located at the head of Mount Desert Island, the Mount Desert Island Oceanarium is one of the best places to see baby lobsters grow. The Oceanarium is home to an array of live specimens, exhibits and displays of the local sea life from around the island, with special exhibits and information about Maine’s famous crustacean, the lobster. The Oceanarium is also home to the Maine Lobster Museum, which focuses on the lobster and the life of a lobster fisherman, with a variety of exhibits, information, historical fishing gear, and fossilized lobsters. Take a tour of a real lobster hatchery, which raises tiny lobsters until they are fully grown for release in Maine waters and view them through a television microscope. Enjoy a guided walk with a naturalist along the Thomas Bay Marsh Walk and learn more about the flora and fauna of a “salt marsh.” The Mount Desert Island Oceanarium and Maine Lobster Museum, are open from 9 a.m. to 5 p.m. daily, except Sunday. Egg Rock Light is a historic lighthouse overlooking Frenchman Bay. Built in 1875 and located on Egg Rock between the Mount Desert Island and the Schoodic Peninsula, the lighthouse is one of coastal Maine's architectural gems. The Light Station consists of a combination light tower and keeper's house, designed with a square tower projecting from the square keeper's house as an active aid to navigating vessels away from the rocky shoreline. There is also a fog station building with a gable-on-hip roof and was originally steam-powered. Listed on the National Register of Historic Places, the Egg Rock Light Station is managed by the Coast Guard and is not open to the public. 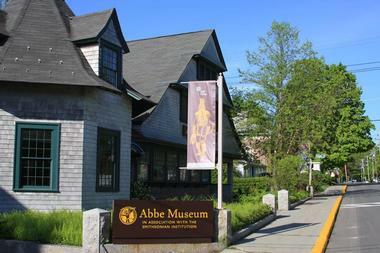 The Abbe Museum is dedicated to exploring and highlighting the history and culture of Maine’s native people, the Wabanaki tribe. The museum is spread over two locations in Bar Harbor on Mount Desert Island – one at Mount Desert Street in the center of Bar Harbor and the other at Sieur de Monts in the Acadia National Park. The museum’s collections feature a large variety of artifacts made by Native Americans during prehistoric and historical times, and later by Europeans who settled here in Maine in the early 17th century. Examples of such artifacts include arrows and spearheads, harpoons, combs, and a rare flute that dates back to more than 2,000 years ago. The purpose-built Sieur de Monts building is one of Maine’s distinctive architectural structures and an excellent example of Mediterranean architecture. The Abbe Museum is open daily from 9 a.m. to 5 p.m. 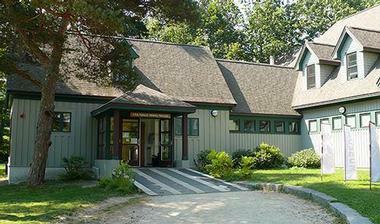 The George B. Dorr Museum of Natural History is dedicated to exploring, interpreting and exhibiting the natural world of Maine and its surrounding regions. Housed in the building that used to be headquarters of Arcadia National Park, the Museum is home to an array of interactive exhibits and displays that visitors can touch, feel, and smell, as well as dioramas of local coastal wildlife. A large tidal pool filled with various marine creatures, including hermit crabs, sea snails, and starfish is popular with younger visitors and a gift shop offers an excellent selection of gifts, books and other trinkets related to the natural world. The Museum presents a variety of educational programs and activities relating to natural history, ranging from museum tours and nature walks to whale anatomy scavenger hunts. There is no better way to see Mount Desert Island, Frenchman Bay, and Acadia National Park than the way birds see them – from the air. Acadia Air Tours offer a number of different Aviation Adventures: Acadia Park Tours, Romantic Sunset Flights, Lighthouse Tours, and Fall Foliage Flights. You can go with a two-passenger glider, two-passenger open cockpit biplane, or a four-passenger Cessna 182 Skylane. For adrenaline addicts, there are also Aerobatic Warbird Rides in the original WWII Navy "SNJ". To protect the environment and the enjoyment of those on the ground, all of the flights are at least half mile outside of the park boundaries and at no less than 2,000ft altitude. You will have a spectacular view without disturbing animals or people. Diver Ed's Dive-In Theater offers a unique marine experience. Professional local divers, Diver Ed and his sidekick “Mini Ed” take visitors on a scenic boat ride out to the beautiful Frenchman Bay in Acadia National Park, where they dive to the floor of the ocean with specially equipped video and sound equipment. Once there, they film what they see, allowing visitors up on deck to share in their underwater experience. They then return to the boat with a variety of sea creatures that guests can touch, feel, and observe before they are put back in the ocean. Diver Ed's Dive-In Theater also offers Park Ranger trips which include an extensive tour of Frenchman Bay, exploring various locations in Acadia National Park for marine creatures such as seals, porpoise, and eagles. The 1932 Criterion is a historic performance space and a community theater that shows first-run Hollywood films and a variety of music and dance performances, live shows and children’s programming. Built in 1932 in the Art Deco style, the Criterion was established during Bar Harbor’s heyday, when it was the go-to summer holiday destination for the wealthy. Acadia Photo Safari is a small company run by local, professional photographer Howie Motenko that offers hands-on nature photography workshops in and around Acadia National Park. Workshops teach guests about camera settings, compositions, visual awareness, and techniques and tips to capturing Acadia’s incredible natural beauty. The photographic workshops are available for all skill levels from beginner to advanced and held in small, intimate groups to ensure maximum focus. Located at the end of West Street in Bar Harbor, overlooking the town pier and Frenchman Bay, Agamont Park is a beautiful green sloping park with panoramic views. 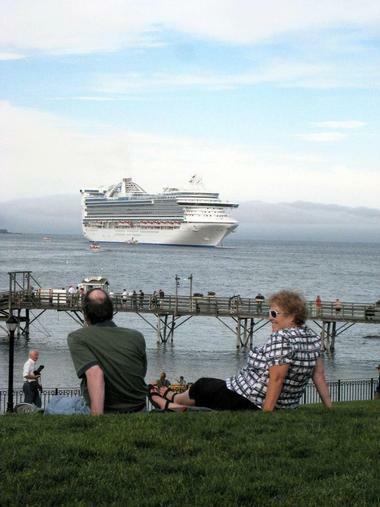 A perfect locale for relaxing with a picnic and watching the yachts, lobster boats, and sailing vessels in the bay below, the park offers a stunning visual scene of New England coastal life. The park is full of beautiful blooms during the summer months and the historic Shore Path runs along the rocky shoreline for 1/2 mile, providing spectacular views of the ocean and the Porcupine Islands. This park has free Wi-Fi. 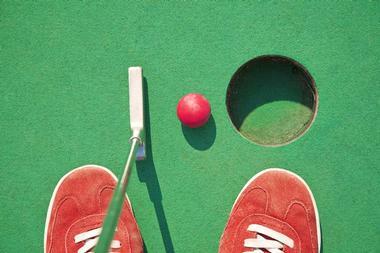 Pirate's Cove Adventure Golf provides a wholesome, fun-filled entertainment option for the whole family. Established in 1983 in Traverse City, Michigan, Pirate's Cove Adventure Golf can be found in various locations across the country, including Maine. The pirate-themed adventure park offers visitors an opportunity to test their skills on various fun and challenging golf holes, against the backdrop of rushing waterfalls and streams, lush landscaping and 18th-century pirate-themed décor and props, including a full-scale pirate ship. Designed specially designed for maximum enjoyment for both adults and children, the range of courses are ideal for fun family gatherings and group activities. If climbing is on your bucket list, there is no better time, nor place, than doing it in magnificent Acadia National Park. Highly-qualified guides at Acadia Mountain Guides Climbing School set standards in safety and provide climbing courses for all ages. Visitors can choose from half and whole day rock and ice climbing sessions for individuals, families, or groups, regardless of skill level or age. All equipment is provided. 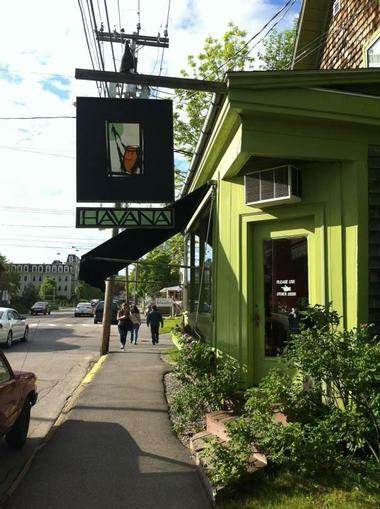 Havana is an upscale restaurant in downtown Bar Harbor with a cheerful, colorful décor that brings a tropical vibe to the cool coast of Maine. The cozy, elegant dining room is welcoming and comfortable and the restaurant’s outdoor patio, open during the warmer months, is spacious and magical with little lights decorating the arbor. The cuisine is contemporary American with Latin influence and a few touches from the rest of the world. You will not find the typical Cuban street food, but upscale treats such as seafood paella and Ancho Braised Short Ribs. The excellent wine list has labels from all over the world, carefully chosen to go with the menu. Acadia National Park, along Maine’s magnificent rocky coast, is the only northeast national park that includes its starry night sky as one of its attractions. Natural darkness with no light pollution offers stunningly clear views of the Milky Way spreading overhead in all its glory. It is a breathtaking sight that unfortunately two-thirds of Americans are not able to see at home. To celebrate this, in 2009 Friends of Acadia and Acadia National Park started hosting the Acadia Night Sky Festival, a celebration of Acadia’s night sky full of bright stars. The celebration includes films, outings, talks, workshops, and big parties, including the Star Party on Cadillac Mountain. A bioluminescent night paddle is a night paddling activity in Castine Harbor, where glow-in-the-dark organisms dazzle with their own show. 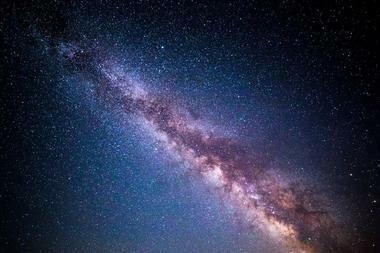 And there is, of course, a lot of stargazing. The upcoming festival dates are September 5-9, 2018. 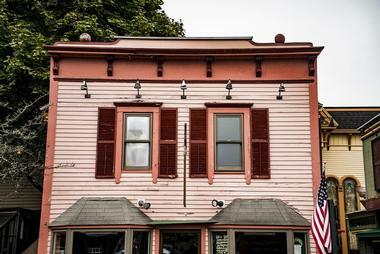 The Bar Harbor Historical Society is the principal historical society of Mount Desert Island and Bar Harbor in Maine. 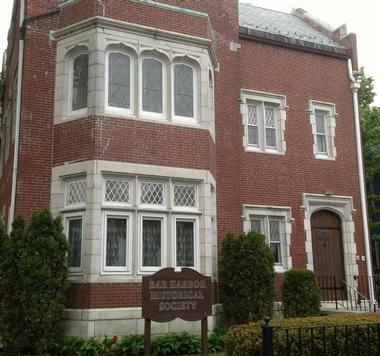 The society’s Museum is dedicated to showcasing all historical materials relating to the town of Bar Harbor in the form of excellent exhibits and displays of various artifacts and items. The Museum is located at the former St. Edward's Convent on Ledgelawn Avenue, which is an architecturally distinguished building itself. Designed by local architect Milton Stratton and built in 1917, the building is an outstanding example of the Jacobean architectural style of design. Signature exhibits in the Museum include a celebration of the life of George B. Dorr, the father of Acadia National Park and the History of Bar Harbor. The building and museum are listed on the National Register of Historic Places and open Monday through Saturday from June to October. National Park Sea Kayak Tours is a mobile kayak company that offers quality eco-friendly sea kayak tours on the remote western side of Arcadia. Experienced sea kayaking guides take visitors on exploratory kayaking trips along the undeveloped Coast of Maine, sharing their knowledge of the local marine environment and its inhabitants. Tours are run according to the weather conditions and venture into off-the-beaten paths areas such as Western Bay, Blue Hill Bay, and occasionally Somes Sound, covering up to six miles on a half-day trip. Tandem (two-person) Boreal Esperanto kayaks are used, which have rudders to prevent tipping and life jackets are provided. No experience is necessary and all levels of paddler are welcome. Acadia Bike is a tour company that specializes in running custom group bicycle tours and bicycle rental programs in Acadia National Park. Acadia Bike caters for solo riders and large groups and visitors can choose between self-guided or guided tours, which are led by a professional bike guide. Top of the range bikes are provided and delivered to the park if required, and guides are on hand to give advice, information, safety equipment, helmets and, other things necessary for the tour.